Hiya! Sorry about all the unreturned emails. I will be getting on that tomorrow morning... the life it eat the head when it's not the most optimal time for it. Eh, we go on. So today's prize is a set of needles and stitch markers. 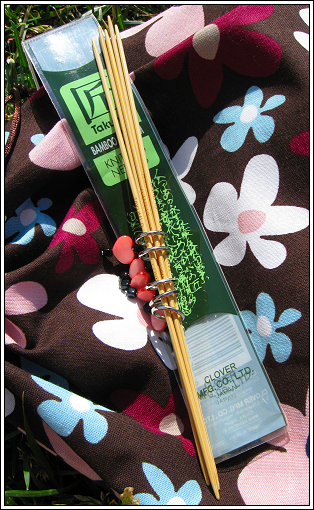 It's a set of Clover Takumi DPN's. Size US 0 / 2.0 mm. Never used from my stash of needles. I bought these back when I was a new knitter and all these snobby knitters told me that you are only a good knitter if you knit on a size zero. So wanting to become a better knitter I got the zero's. Turns out when you knit as tight as I do size zero really doesn't do much for you. Not on socks at any rate. So they have pretty much no use for me. 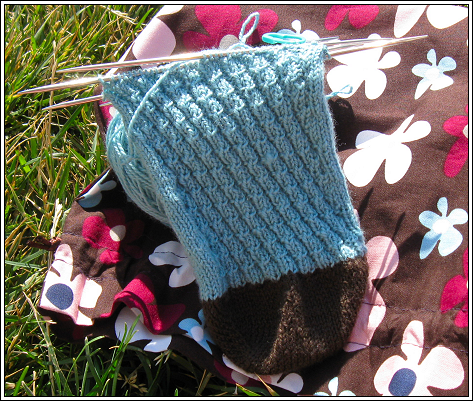 Here's the current sock I'm working on for SoS. It's the same pattern as the last socks I knit for Cookie. They are my Dizzy Otter Socks. I'm using Cookie Cutter Short Rows for the heels and toes and doing them Toe up. 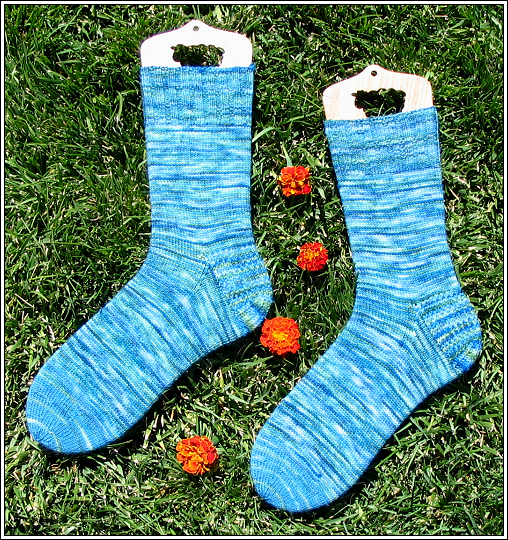 The ones I knit for Cookie were cuff down and flappity. 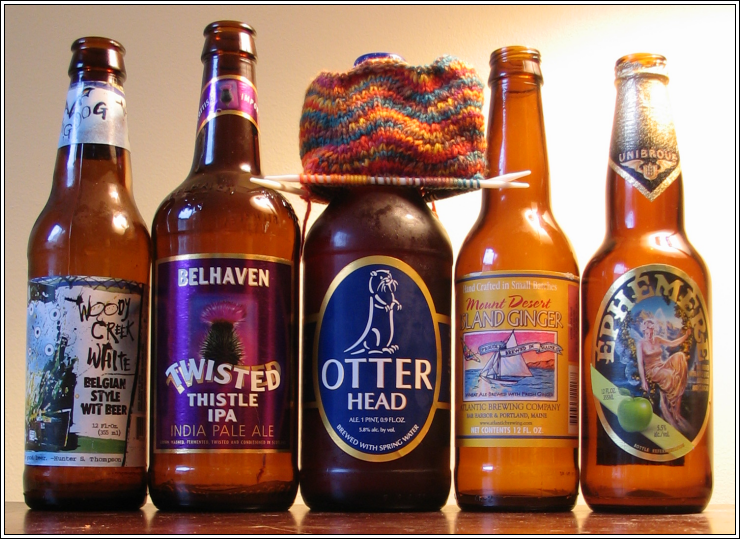 Okay I'm going to get back to my knitting. I have three pairs of socks going right now. 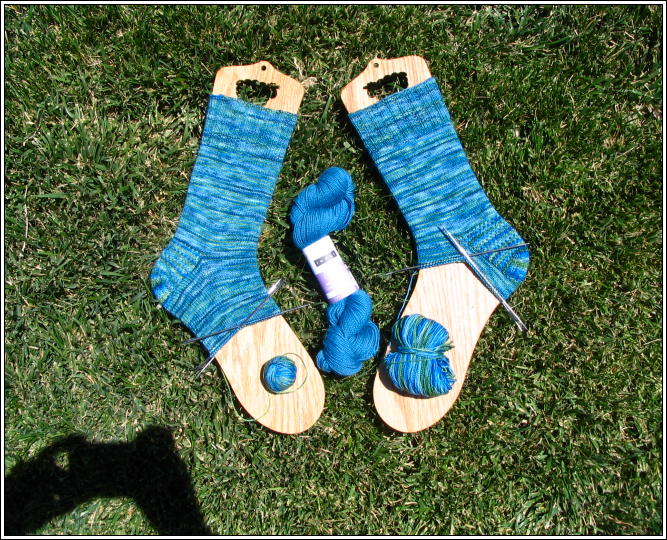 They are all in various shades of blue yarn. Two of them are blue with brown yarn. o.0 I told you the life it eat mah head. That or the cat, she was licking my face again last night. I has a flavor! These are my very first pair of Toe Up Short Row Socks. 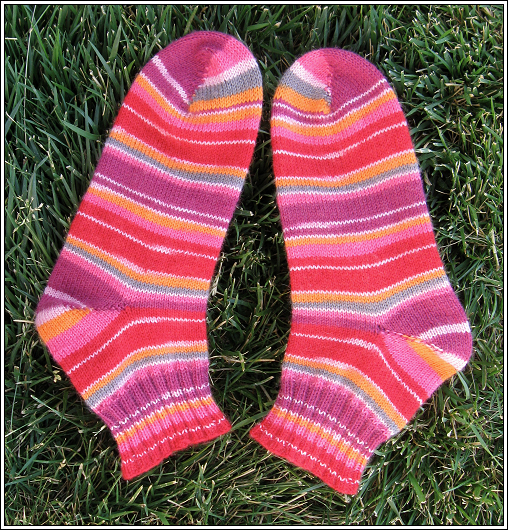 They are also my first pair of Socks for the Summer of Socks 2008. I love them sooooo much! Pattern: I used Cookie's Cookie Cutter Short Row Tutorial for the heels and toes. With a plain vanilla stockinette for the foot and part of the cuff, with a two inches of ribbing on the top of the cuff. The total cuff is 4 inches from the heel. Yarn: Regia Crazy Color #5439. 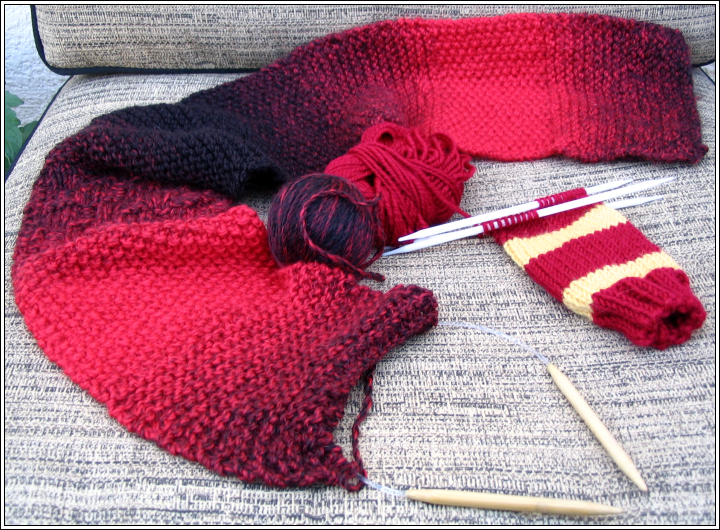 Yardage: 230 yards/50g per skien. 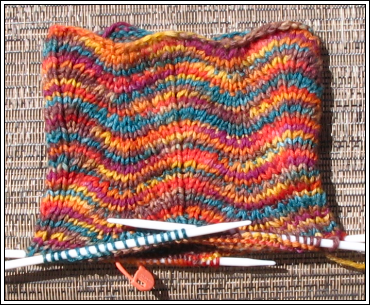 I used two skeins, though I still have a fair amount left from each one. 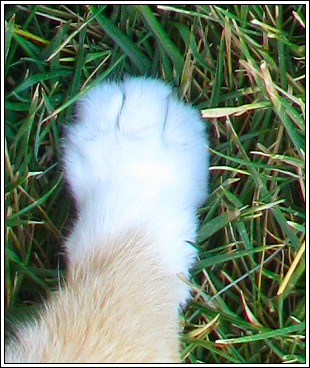 After we took the sock pictures we played in the catnip. Well she played and I sat beside her and petted her. I'm pretty sure she was in kitty heaven. Cats do in fact smile. She was a blissful little monkeybutt. Think I'll go give her a hug now. Cookie Cutter Short Rows, Halfway Done! 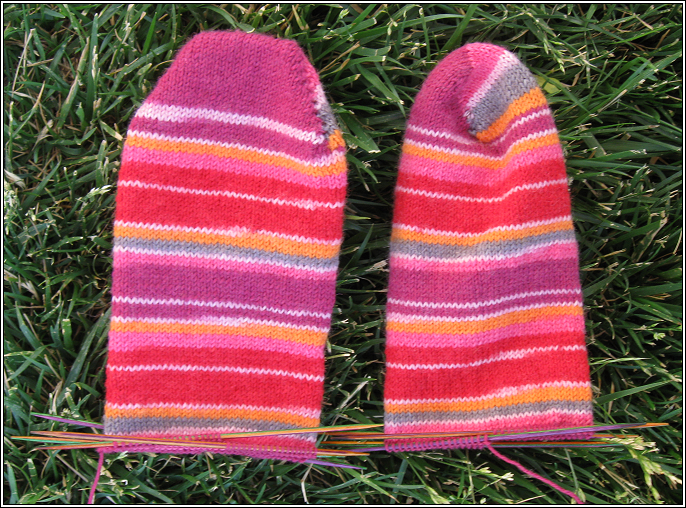 They are my first pair of toes up socks and short row socks. 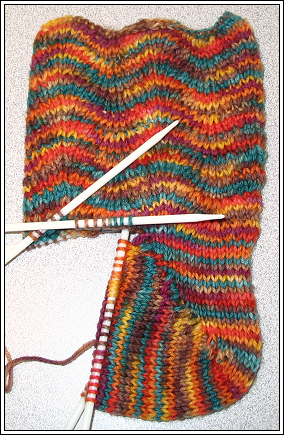 Though one time I did a short row heel using Cookie's method. Er what I mean to say is I have a lot of cool sock yarn that I wish I had more time to knit. I think I need to get rid of some of my yarn. It's too much pressure. All these material possessions weigh me down. Look for give away prize rich contests in the future. Anyway my point of the post is that Cookie's Method really maximizes your knitting time. Or at least that's how I'm feeling about it. What is really going on is that it's just so damn fun you can't put the needles down. Her tutorial is so easy to use and the results are just fantastic. Whether you are a Toe Up Short Row newbie like me or a seasoned professional looking to branch out in a different direction I'd say check it out. Plus I get to knit them while watching So You Think You Can Dance. Wheeeeeeeeeeee!